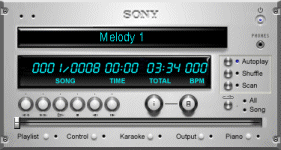 vanBasco’s Karaoke Player (aktualna wersja 2.53) - this program is one of the most popular MIDI music files player with texts of songs. In this program you can, amongst the other things, change the tempo, volume and tone of a given composition. The program can play files in this formats: MIDI (.mid, .midi), Microsoft RMID (.rmi) i Karaoke (.kar). vanBasco’s Karaoke Player propagates as a freeware, that means it is completely free. Operation System: Windows 95/98/ME/NT 4/2000/XP. The default download of vanBasco's Karaoke Player includes an English, a German, an Italian and a Spanish language pack. Here you can download more language packs. To install a language pack, simply download .exe file and run it. To install a new skin, download the .zip-archive of the file, extract to the installation folder of vanBasco's Karaoke Player (e.g. C:\Program Files\vanBasco's Karaoke Player). Then, inside vanBasco's Karaoke Player, open the setup dialog. (You get to the setup dialog by clicking the note button in the top-left corner in the main program window of vanBasco's Karaoke Player and choosing "Setup...".) Choose the "Misc" tab. In the box labeled "Skin" select the skin you just installed. Then close the setup dialog by clicking the "OK" button. The last step is to restart vanBasco's Karaoke Player. 1. Question: With songs I play, the lyrics are not displayed in the Karaoke Window. Why? Answer: First of all, vanBasco's Karaoke Player will only display the words if the song file you are playing includes them. Files with the .mid extension generally do not contain words. Files that do include lyrics are usually renamed to have a .kar extension. 2. Question: I want to add lyrics to an existing MIDI file - how can I do this? 3. Question: Can I print the words of a song using your player? 4. Question: How can I print a playlist? 5. Question: Does your player play Karaoke (CD+G) discs? Answer: No, it doesn't - vanBasco's Karaoke Player plays MIDI Karaoke files only. However there are a number of CD+G software players available. 6. Question: When I make changes to the tempo or key of a song, how can I save the changes back to the MIDI file?